When was the last time you were in Box Hill? Here's how to spend a day of eating there. For decades, Box Hill was the go-to spot for Cantonese cravings. Think yum cha with trolleys, Hong Kong-style cha chaan tengs (tea restaurants), barbeque houses with glistening roast meats hanging in shop windows and a bustling marketplace that sold Asian greens, offcut meats and spicy condiments. As years went by, new schools, TAFE and improved transport connections to universities brought a younger population. The extension of the 109 tram and upgrades to the train station, shopping centre and parking facilities made Box Hill more accessible to the rest of Melbourne. Today, the suburb is as festive as ever with the main thoroughfares decorated in red lanterns and paper firecrackers. Added to this is the collection of cheap-and-cheerful restaurants influenced by Taiwanese, Japanese, Korean, Vietnamese, Malaysian and regional Chinese communities. While there may be plenty of options, let’s make one thing clear: the eateries in Box Hill won’t win any awards for stylish fit- outs or outstanding customer service. But the variety of cuisine at such thrifty prices continues to attract hoards of hungry customers. Here are six places that reflect what’s changed (and what’s stayed the same), at a suburban dining destination that’s well worth repeat visits. You can’t miss Roast Duck Inn. You’ll see customers on dining chairs set up on the footpath, waiting for a table or their takeaway duck – a whole one, with plum dipping sauce, is 30 bucks. If you eat in you’ll be greeted with complimentary soup (made from duck bones) served by friendly staff in red polo shirts. After a busy service, the owner, Sophia Li, can be found at a corner table eating her own lunch. Li moved to Australia from Hong Kong 30 years ago, and found herself running a 150-seat Chinese restaurant in Warrnambool. She also did stints in Geelong and Melbourne before moving permanently to the big smoke three years ago. 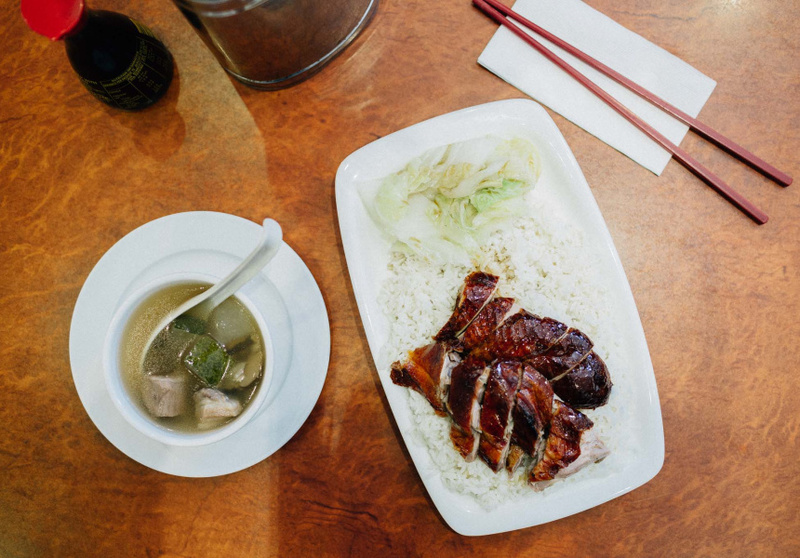 The duck recipe was perfected by Cantonese chefs with more than three decades of experience. The menu offers other meats, too, such as crispy-skin roast pork and soy- sauce chicken. “Once our customer base was exclusively Cantonese speakers. These days, we get people from all backgrounds buying our ducks,” Li says. For an authentic Cantonese experience, head to New Age Café, one of Box Hill’s many cha chaan tengs. These are traditional restaurants in Hong Kong where groups share a meal of faan (rice), and sung (dishes such as fish, meat or vegetables). “It’s more casual and everyone can order individually. You can get wonton noodle soups, curries, sandwiches, omelettes, whatever you like,” owner Ben Leung says. Besides an extensive menu (which drifts into some surreal interpretations of Western dishes (such as a baked ox-tongue spaghetti), cha chaan tengs are famous for efficient service, no- frills dishes and value for money. At New Age, nothing on the a-la-carte menu is over $15. New Age has been part of the Box Hill dining scene for 17 years and it hardly closes (it’s open from 7.30am until 10pm, seven days a week). Leung moved to Melbourne from Hong Kong 15 years ago and remembers New Age being just one of a handful of Asian restaurants in Box Hill.“Now it’s one of 40-plus Asian restaurants, maybe even 50,” Leung says. Part canteen, part catering business and part grocery store, you will find mother-and- daughter team Jean and Suzanne Kwong running this tiny and always busy Malaysian eatery, which opened in 2011. Hokkien mee, a noodle dish widely available in Penang, is the signature item. 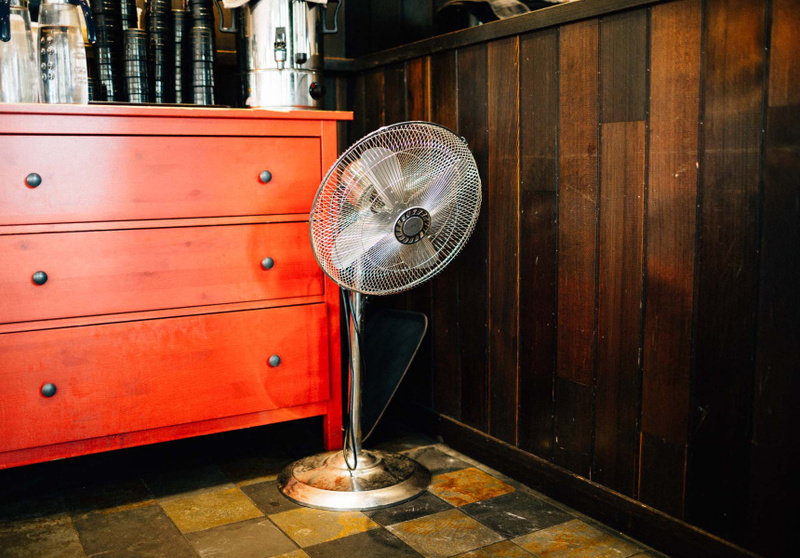 Originally from Penang, mother Jean is behind the stove while Suzanne manages the front-of-house, takes photos and shares recipes on a food blog. N yonya kuih (colourful Malaysian desserts) are another house specialty. These bite-sized treats are made on site, fresh daily and are available to take away. Made of glutinous rice, rice flour, coconut milk and sugar, pandan juice is added for fragrance and a vibrant-green natural colouring. The mixture is then steamed until it sets. Then another layer, with a different colouring, is poured and steamed on top. “A nine-layer kuih is very popular because everyone loves peeling the layers to enjoy the flavours of the coconut and pandan. But making it is tedious so you won’t find too many places making them,” says Jean. Tien Dat opened in 1983 and was the first Vietnamese restaurant in Box Hill. “Back then, Box Hill was very quiet,” says owner Huong Pham. “The railway was overground and Box Hill Centro was still being built.” Pham took over the family business in 1996. “There were a handful of newly migrated families from Hong Kong and one Chinese grocery store,” Pham says. The Phams decided to make Box Hill home after fleeing war at home. They chose the suburb for the larger land and houses than those in Richmond, the more popular Vietnamese hub at that time. Over 30 years the Phams grew their business by introducing pho, bun (rice vermicelli) and rice paper rolls to a then predominantly Anglo population. As the waves of new migrants arrived in the area, the menu has evolved to include rice and noodle offerings and dishes incorporating Chinese influences, such as spicy salt-and-pepper squid and crispy- duck hand rolls. 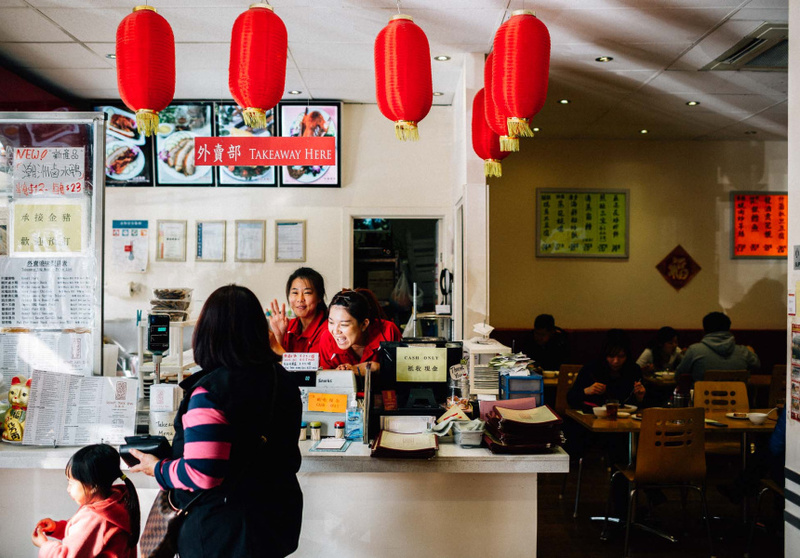 When David and Camy Lee migrated to Melbourne from Shanghai some 30 years ago, they opened a dumpling house in Chinatown and the concept of generous serves, cheap food and no-frills service was introduced to Melbourne. After 10 years in the CBD, the couple sold the business and moved their shop to Box Hill, a then-burgeoning suburb with a growing Chinese population. That was 14 years ago. Since then, David and Camy’s dumpling house has developed a cult following among locals and workers in nearby offices. Sure, the leather booths may be dated and the service is somewhat aloof, but the distinctive waft of black vinegar is a sign of one serious dumpling institution. There are 18 (steamed or fried, beef or pork, vegetarian or prawn, soup or dry) dumpling varieties on offer. And if none of that suits, the Shanghai fried noodles is a fail-safe option. And the chewy chili-oil tripe is perfect for intrepid eaters. This article first appeared in Broadsheet's 2015 winter print issue.